The project arose from an EPSRC initiative on systems integration. The idea was to apply measurement techniques developed for measuring complexity in factories, to supply chains (see Complexity in Manufacturing). The basic idea is that the presence of complexity disrupts the flow of materials and information between the customer and his supplier, by creating barriers. The aim of the research was to test the hypothesis that the presence of complexity inhibits supply chain integration. The objectives were to take measurements of information and material flows between a company and one of its suppliers, to reveal where integration is falling down and see if this has some basis in the complexity of the total process. It proved possible to show not only that complexity prevents supply chains from integrating, but also to identify specific factors involved. Not surprisingly, issues such as varying levels of demand, uncertain demand patterns and unreliable manufacturing operations contributed. However the study produced some unexpected findings. For example other inhibitors included incompatible IT systems, differing performance measurement systems and even the policy of holding inventories within the chain. As a consequence, the study raised questions about the desirability of following a strategy of supply chain integration. Findings suggested that such policies could removed the freedom of the partners to act in their own best interests, and would make the resulting chains much less robust. The project also concluded that there was little evidence for the presence of the Forrester or Bullwhip effect in the chains studied. What happened instead was that suppliers were used to attenuate the uncertainty generated by their customers (exporting complexity to the supplier). It also proved possible to demonstrate that reducing complexity in a supply chain also reduces operating costs. 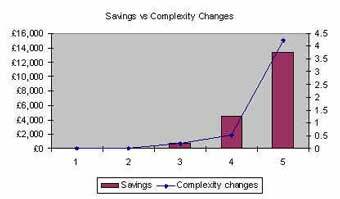 The chart below shows savings actually achieved against change in the complexity index. The numbers on the x axis represent distinct cost savings initiatives. Finally, the original mathematical model used for factory measurement was found to be impractical for supply chains. The reason was that the added complexity of supply chains meant that the factory data gathered methodology could not be used here; the data volumes needed would have overwhelmed the observers. A different approach was developed involving observing changes in the chain such as stock movements, alterations in delivery dates and delivery quantities. This new model appears to lend itself to the automatic collection of data and to supply chain monitoring.